Crater Park, in Haikou, capital of Hainan province, is a geological park and popular tourist destination that offered discounts and good travel choices, to promote tourism during "Golden Week", Feb 2 to 8. In addition to ticket discounts and flavorful local foods in its restaurants, the park had folk performances like the bamboo dance, on stage, throughout the week. There was a new tourist route through a historical village that has been preserved over the centuries, added to the volcano views. 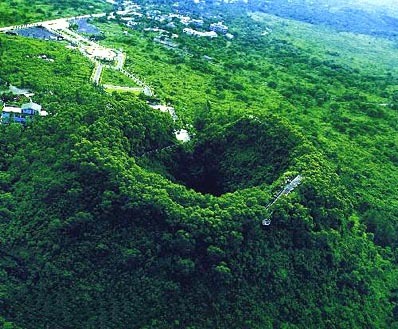 The volcanic park, 20 kilometers from downtown Haikou, covers a 108-sq-km area and has a cone formed more than 10,000 years ago.